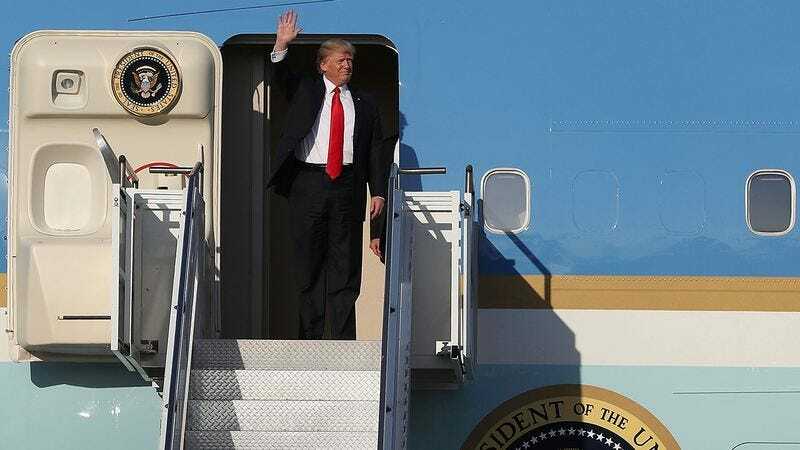 Following an eight-day whirlwind tour of Europe and the Middle East, President Trump is back on American soil. Here are all of the foreign invasive species he brought back with him to the United States. 1. Mediterranean brocade moth: Several of these notoriously destructive agricultural pests latched to the back of Trump’s suit jacket while he was in Italy and later found safe haven in his luggage, laying numerous batches of hairy brown eggs during the long overseas flight back to the U.S. These nasty little buggers can lay waste to massive swaths of economically vital crops in no time, so here’s hoping they don’t stray too far from the White House. 2. Raccoon dog: Trump spotted a pair of these fuzzy little predators nesting behind a dumpster in Belgium and got a huge kick out of them, ordering an aide to toss them in the Air Force One cargo hold so he could show them to his adult sons, Eric and Donald Jr., when he got back to the states. The dogs, which escaped the cargo hold and scurried off into the woods immediately after touchdown at Andrews Air Force Base, have terrorized Central and Eastern Europe in recent decades by decimating critical bird and amphibian species and rampantly spreading rabies and tapeworm wherever they roam. 4. Cotton whitefly: A female whitefly flew into Trump’s mouth while he was trailing other G-7 leaders in a golf cart in Sicily, depositing her larvae in the warm, nurturing moisture of his gum line. Trump only noticed the parasitic larvae once back in America, after they’d already been feasting on his tooth enamel for several days, upon which he immediately spit them out onto the White House South Lawn. Fingers crossed that the larvae didn’t survive, as even a small infestation of cotton whiteflies can devastate crop yields in a given region, crippling food production and wreaking economic havoc. 5. Sika deer: Upon landing at Andrews Air Force Base, five or six of these tree-killing forest pests stampeded down the staircase of Air Force One just moments before President Trump and First Lady Melania emerged from the plane. No official explanation was given. 6. Cypress canker: Sharp-eyed internet sleuths spotted this fearsome red micro-fungus growing on the president’s hand in photos of him chatting with Pope Francis, and in official White House photos taken this morning, it appears he still hasn’t washed it off, as it seems to have spread and enveloped his entire arm. Should the disease expand to neighboring ecosystems, it could lead to the death of millions of trees and widespread soil erosion. 7. Norway rat: While Trump brought a couple of these rodents on Air Force One in an innocent attempt to scare his wife, in doing so, he might’ve brought a major headache stateside. Not only is this critter known to decimate native bird populations and other small mammals, it also poses a serious health risk by serving as a resilient vessel for numerous serious viruses and diseases, including hepatitis E.